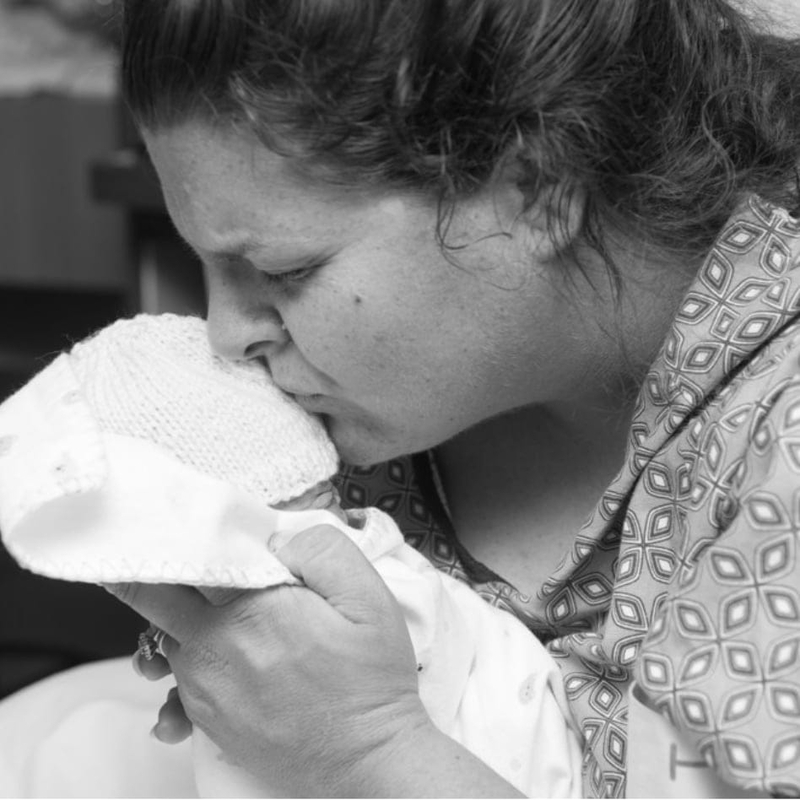 Baby Levi Rouse receives a kiss from his mother. Danielle Rouse donated a CuddleCot to Fort Sanders Regional so families of stillborn babies will have more time to say goodbye. The birth of a baby is usually a happy time, but there was nothing happy about it for Danielle Rouse. She spent two days in labor with sorrow and anxiety, and delivered a child she knew would be stillborn. Baby Levi was tiny and frail, but exactly the size he was supposed to be at 29 weeks. Danielle cradled him in her arms. “All I did was hold him, and I didn’t want to let him go,” Rouse says through tears. As a nurse, Rouse was all too aware that time was limited, and there were other people who needed to spend time with him, too: the grieving father, the big sister who had wanted a baby brother so much, and the grandparents who had been so excited about a new grandchild. 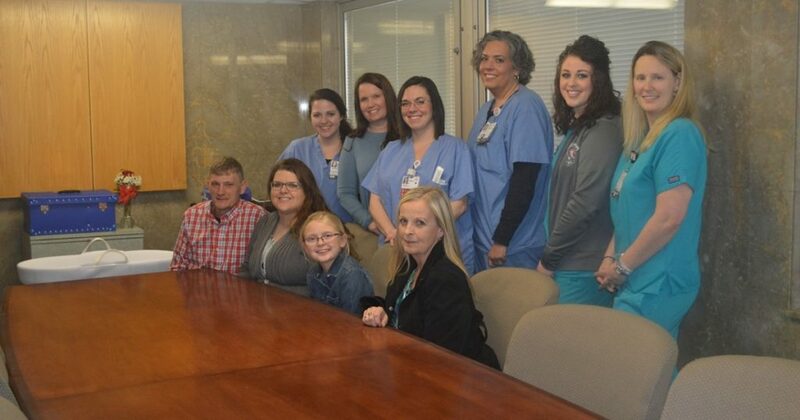 Danielle Rouse and her family are pictured here with some of the Women’s Services staff that attended to her during Levi’s delivery. Rouse still sheds tears today, but the grief isn’t as overwhelming as it used to be. She has decided to turn her tragedy into something positive by giving other families what she couldn’t have when her baby came into the world. Rouse has donated a Flexmort CuddleCot to Fort Sanders Regional Medical Center. A portable crib unit with a soft water-cooled pad, the CuddleCot’s temperature preserves the body of a stillborn baby while allowing grieving families to have time for closeness and closure. The technology is lightweight, quiet and portable, and can be cleaned and reused by the hospital when needed. One day after the darkness had finally begun to lift from her heart, she started thinking about the best way to honor Levi’s memory and help other grieving families through the devastation she experienced. She remembered hearing about the CuddleCot, looked it up online, and saw that it cost about $3,000. She remembered the friends, family, coworkers and church members who had rallied around her through the end of her pregnancy and during the hard times afterward. Maybe they would be willing to help get the money together. The post was shared over 200 times and in about a month, Rouse had raised enough money to donate a Cuddle Cot to Fort Sanders Regional. Rouse says she donated the item as a service to the community and to thank her doctors and nurses for their care. Rouse is pregnant again, and her baby girl is due within days of the anniversary of Levi’s death. As she focuses on bringing new life into the world, Rouse also has the joy of knowing Levi’s death and her donation will bring comfort to countless families. Read more about our women’s services department here.